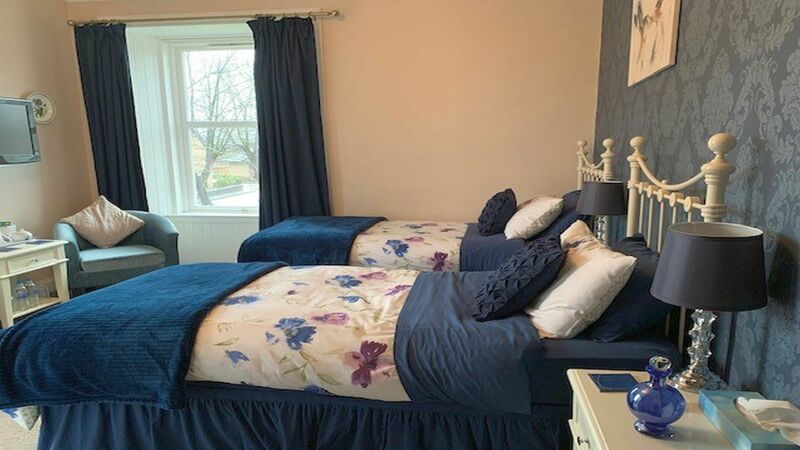 This is a large, south facing sunny family room with ensuite facilities and has a double and two single beds making it suitable for a family of 4 or for a party of three. 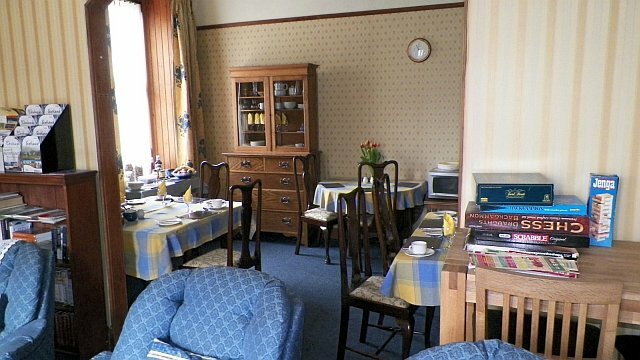 This was the Butterscotch room before redecoration. 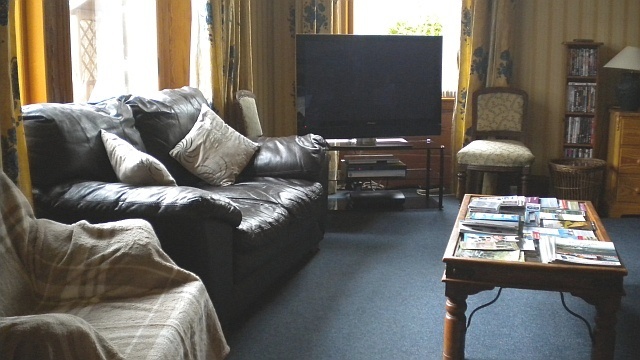 This large family room can sleep 2 or 3 with 1 double and 1 single bed. Although the feature wall appears darker than it actually is, the rest of the room is light and airy. 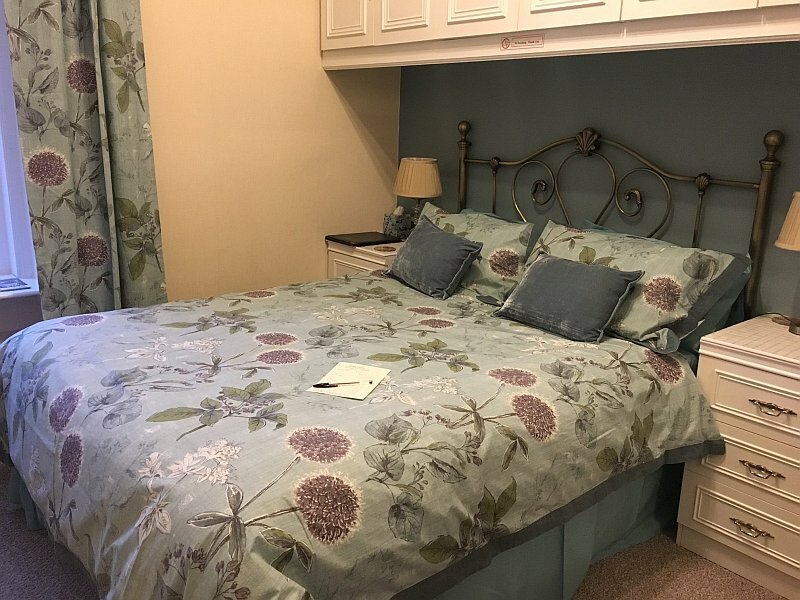 This room has a spacious private bathroom for sole use, with a bath and shower over, ideal for walkers and golfers easing aching bones! 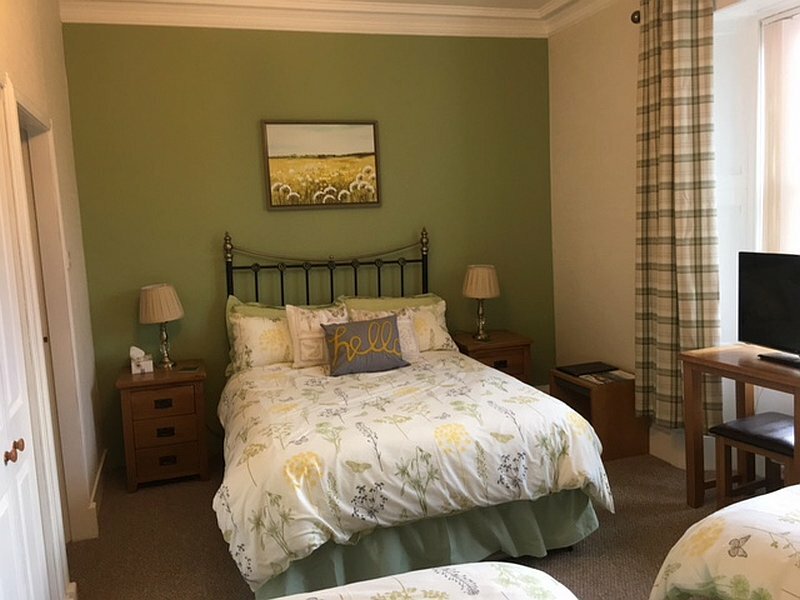 This spacious twin ensuite room has windows facing both south and west making it a very bright room, overlooking two separate churches. 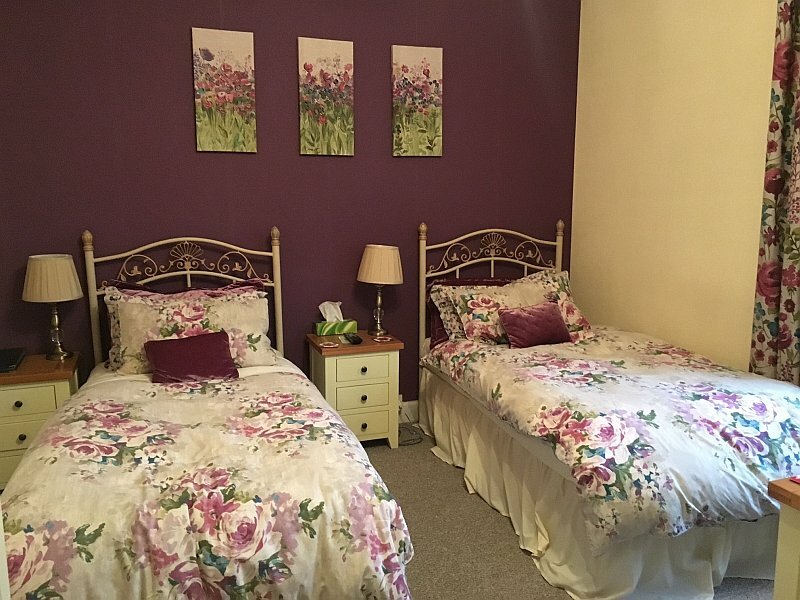 A very cosy double room with a spacious ensuite. It has been well fitted and provides lots of storage, and overlooks the garden area to the east. 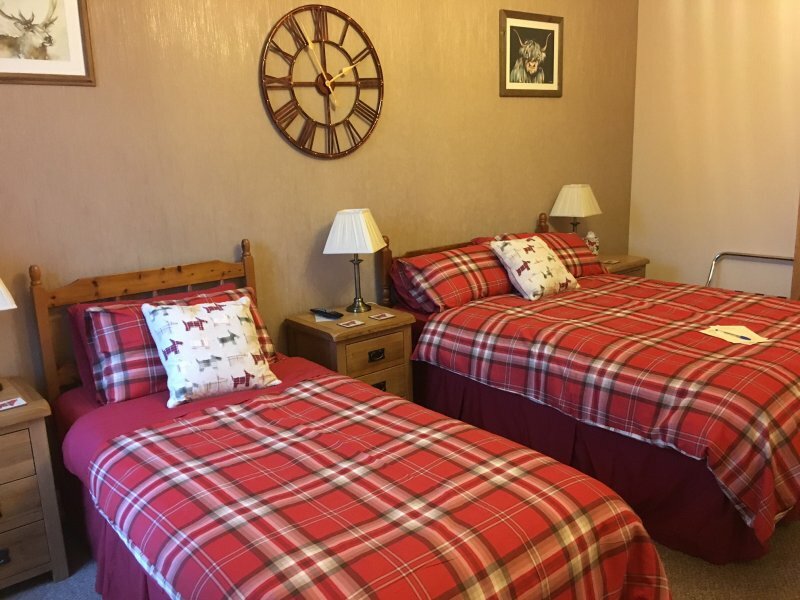 A quiet twin room at the back of the property, fully refurbished with en-suite shower. Lounge - This is a peaceful room to relax in with lots of tourist information, games, and books also a digital tv should you prefer to watch here rather than in your own bedroom. A comfortable room where you can enjoy a freshly home cooked breakfast. Scottish reared and cured bacon is also served followed by homemade granary bread and preserves. Special dietary requirements are catered for including homemade bread for coeliacs, vegetarians and any other dietary needs - some advance notice would be helpful. A high chair is available for babies or toddlers. Breakfast is normally served from 7:30 - 9:30am, or by arrangement. The Gardens / Hot Tub / Garden Seat. After a hard day at the beach, out tramping on a long walk or at work luxuriate in our garden hot tub. A sheltered corner to relax in - ideal for catching the evening sun. Dine al fresco and enjoy Julie's home cooking. children 12 and under at half price if sharing with 2 adults. All beds are top quality and all have barrier covers on the mattresses. Each room has Digital TV, hostess tray with homemade shortbread, and a hairdryer. Also there are tea, coffee and herbal tea making facilities, radios and alarm clocks provided for your use. A travel cot is available on request. There is an iron and ironing board for guest use. There are drying facilities for your wet clothing and boots, shoes or wellies and golf clothing. We are listed in various walkers and cyclist welcome schemes. For the avid walker we have arrangements in place for luggage transportation with Fife Coastal Path Holidays. If we can help in any other way please contact us. "Please vacate your bedroom between 10:30 - 11 a.m. on morning of departure, to assist with timing of cleaning and changeovers." Dunclutha is a WiFi zone. Access for guests is available.